The six bullets shown left were removed from our vests following a ballistic trial. 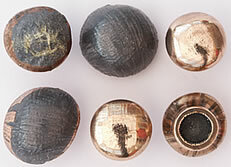 Upon impact the bullets deform to a mushroom shape. Close examination reveals the fabric pattern of the aramid weave impregnated in the bullet. The top left bullet still has the gold/yellow Kevlar fibres from the vest lodged in the lead alloy surface. Two Bowie style stabbing knives as used under the UK stab test evaluation procedure from the 1993 standard. All knives used for body armour testing are selected as being representative of a serious assault from a high quality engineered blade. Stab Vest, Stab Vests, Stab Proof Vest and Stab Proof Vests are common terms for body armour with a defined level of resistance to a knife or pointed weapon. The same also applies to bullet proof vest terminology - bullet proof vests have a defined level of ballistic resistance.